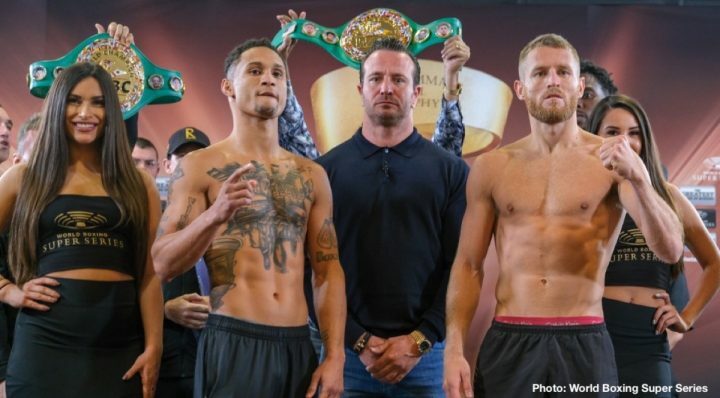 Regis Prograis & Terry Flanagan and Ivan Baranchyk & Anthony Yigit all make weight ahead of Saturday’s Ali Trophy Quarter-Finals at UNO Lakefront Arena in New Orleans. Tickets for the bouts are on sale through TicketMaster.com and at the arena box office. “I can’t wait,” said Flanagan, a former WBO Lightweight World Champion. “Let’s not forget I’ve been the world champion, I have had five defenses of the world title, I have got the experience and I am here to win, take the title home and become a two-weight world champion. The winner of Prograis vs Flanagan faces Kiryl Relikh in the semi-final. “It is going to be a war, don’t expect anything less, I am here to win, I am here to hunt the beast,” said Yigit. The winner of Baranchyk vs Yigit faces the winner of November 3rd’s Josh Taylor vs Ryan Martin in the semi-final. Fans in the U.S. can watch Saturday’s quarter-finals LIVE on DAZN, the global sports streaming platform. To sign up for a one-month free trial, fans can visit DAZN.com or download the DAZN app to their preferred connected device. Undefeated Ivan Baranchyk (18-0, 11 KOs) is destined to become a world champion when he takes on Anthony Yigit in a fight for the vacant IBF Junior Welterweight title as part of the WBSS, Saturday night in New Orleans (DAZN, 8 pm ET). Baranchyk of Miami, Oklahoma via Russia is one of the most exciting fighters in the world as he is a come-forward fighter who likes to throw hard power shots. In Yigit (21-0-1, 7 KOs), Baranchyk is facing a boxer from Sweden, who will be looking to stand in the way of Baranchyk’s dream of becoming a world champion. Baranchyk is looking to become the next world champion under the guidance of Split-T Management. “I am good, and ready for this fight. It has been a dream to become world champion, and Saturday I have a chance to realize that and at the same time advance in this great tournament,” said Baranchyk. “It’s a truly exciting moment in time. To have a client with such a great work ethic, and so much heart, and now seeing him get that opportunity he deserves is an outstanding feeling,” said David McWater of Split-T Management.